A famous Stowe summer recreation facility, Stowe Golf Park is centrally located on the Mountain Road in front of the Sun & Ski Inn and Suites and consists of an 18-hole putting course and mini-kiosk. 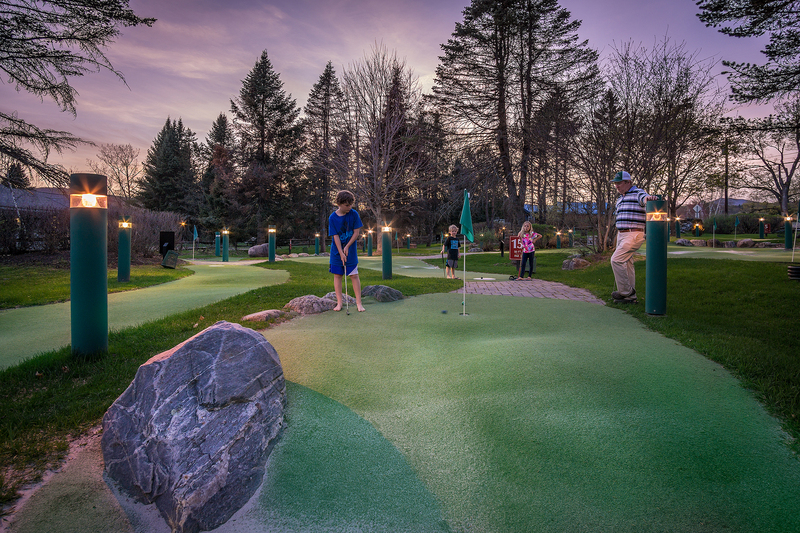 This heavily landscaped and contoured Stowe miniature golf course is in a garden environment and is a welcome addition to Stowe, Vermont summer activities. Stowe Golf Park has been professionally designed as a miniaturized golf course. It strives to simulate a real golf environment and experience. Adults, kids and families alike enjoy the challenge of a game of putting. While keeping score, players of all ages can “read” the breaks in the greens, avoid natural obstacles, fairway hazards, sand traps, rough grass, trees, etc. Stowe Golf Park is now open for the 2018 season! 10:00 AM to 9:30 PM daily.